Artwork by Rosalind Davis collated from some of the notes made on the selection day of the Zeitgeist Open. Selectors Statements Graham Crowley The ZAP Open is a welcome break from the tired and tawdry crop of corporate 'art' competitions. The selection is done entirely by practicing artists. It's one of a growing number of artist led projects that don't involve celebrities, nouveaux riches, art-world, apparatchiks or dealers. The sort of people whose only response to painting (or something similar) is - I like it or I don't like it. Is that it? Yes - and that's the trouble. This isn't a shopping trip. Why should practicing artists subject their work for the approval (or disapproval) of a people who can only make judgements based on their prejudices, their ignorance and/or their taste. All the work entered for the ZAP Open was submitted to thoughtful and extensive discussion. This discussion is only possible when the selectors are all aware of current practices and the prevailing critical context. This is experienced most acutely by practising artists and because of this, the selectors sense of responsibility is about as acute as it could be. The great strength of projects like this is that practicing artists don't necessarily 'like' art. Enjoy. 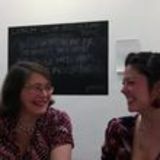 Rosalind Davis I found the process of selecting works for the Zeitgeist Open; profound, meaningful, generous, critical, amazing, tough, revealing, unexpected, delightful. It was a fascinating experience for all of us. particular work they entered will hopefully if perhaps slightly resentfully attest. All five of us are very different as artists and in our taste for the work of other artists. I think the final selection reflects all of us in some way. We don't all unreservedly adore everything that's in, and all of us had moments when we couldn't quite win the battle for a piece of work that we personally liked. In a show with nearly six hundred entries and forty-odd (and let's be honest... probably forty, odd) chosen artists, it would be mad of us or of anyone else to expect to like everything. What everything in the show does share, because we all agreed on it, is that every work in some way seemed to us to have integrity of intent and execution. Whether it made us laugh or it made us scratch our heads or it simply made us say it was an aesthetically pleasing thing, the artist meant it. The artist didn't seem to be chasing a trend, even if they might happen to be part of one. They might clearly know their art history and their predecessors, but they weren't engaged in empty pastiche. Via the image they'd chosen to show us, they seemed to be authentically themselves in some way. I think there's a lesson there for us all, myself included. involved an intense day gathered around a projector, which displayed each entry in largescale. Nothing escaped our critical eyes. With an emphasis on fairness (if this is possible) we viewed each entry anonymously; we were making decisions based purely on a visual image, not on track record or contextual information. The impact and quality of each image flashing before us was crucial – was it well photographed? Had the artist adhered to the submission criteria? Did it capture our imagination? And, most importantly was the image engaging and memorable? After several hours we whittled it down to a long-list. This is when the debate began. Sometimes each selector needed to 'fight their corner' and stand up for a work they passionately believed in, mostly there was a collective consensus on which work went through - the judging was always respectful, considerate and rigorous. The final works in the exhibition hopefully give an intriguing snapshot into artists practicing in the uk today and in some way portray an integrity of thought, execution and content that we all saw. Annabel Tilley It was a day I will always remember with affection: good people, sharp intelligence, wit, curiosity and the feeling that what we were doing had a purpose. It was a meaningful experience – we five gathered there at ZAP HQ with an intense sense of responsibility. I think we all shared a similar anxiety; a self-consciousness about the act of choosing, and how, when it came to it, we would defend our choices, or more difficult still, have the courage to argue against the others. But in the end we developed a mutual respect for each other. We listened to impassioned speeches, declarations of love, and hate, humble questions and bursts of passion, apathy and intrigue. We looked at all 557 images, and quickly developed a rhythm to reject or to keep work in for the next round. There were five or six rounds in total. It was an intense seven hours. Without names, the anonymous process of choosing was, for me, much easier. I wasn’t distracted by who the artist might be. I just concentrated on the image before me, and whether instinctually, it attracted or repelled me. It was like a love affair; the strong pieces stuck in your mind long after, and got better with each viewing. You felt compelled to look closer and for longer, your curiosity was aroused. Best of all was when someone else’s unorthodox choice made you look again - suddenly appreciate something new - or see something in a different way. We all had moments like that: works that we championed. In the end we found the word ‘integrity’ had crept in. The first Zeitgeist Open developed slowly over seven hours and five people’s opinions into a show about work that is sui generis – of it’s own kind, unique. All the work was seen, and scrutinised carefully on the basis of image alone – artists were not judged on their CV, age, art-school history, gallery connections or art-world renown. These 41 artists have between them all a stunning array of achievements. We could tell you that these artists have international careers, they come from across the world, that they have exhibited extensively or very little at all, that they came from famous art colleges now, or 30 years ago. Many have won some kind of art prize, or been involved in major exhibitions. There have been private and public commissions. Their works are in major collections as well as no doubt numerous private collections. They work in paint, drawing, photography and sculpture using a wide range of materials, concepts and processes. They have done residencies, are in publications, they write for publications, they curate. But none of this mattered to us. The work did. And that is why this will be a different open exhibition. The philosophy behind The Zeitgeist Open – judged on a single anonymous image – was to create a really open Open, resulting in an exhibition that is about the artwork, and about intelligent artists making critical, educated and also instinctive decisions about the artwork: looking at 557 works over seven intense hours meant for the judges that each work had to hold its own; had to engage them totally and immediately – subtly or with force. Thank You, for visiting, reading, experiencing, sharing….for being part of something. Rosalind Davis and Annabel Tilley. Press: Over 40 exhibitors at new artist-run open Another day, another open exhibition – but is the inaugural Zeitgeist Open doing things differently? Ben Coode-Adams, Vernal Equinox - Moon of Winter Gives Way to the Sun of Spring From 557 images received, 41 exhibiting artists have been selected for the first edition of The Zeitgeist Open, which bills itself as an open exhibition with a ‘difference’. Judge and painter Graham Crowley says: “It’s about creating opportunities for ambitious artists, creating new networks and bringing new audiences – curators, gallerists, collectors and the general public – to artists.” Crowley is joined on the judging panel by Alistair Gentry, David Kefford and Zeitgeist founders Rosalind Davis and Annabel Tilley, all of whom are artists. All work was seen on an anonymous basis and there was no pre-screening. 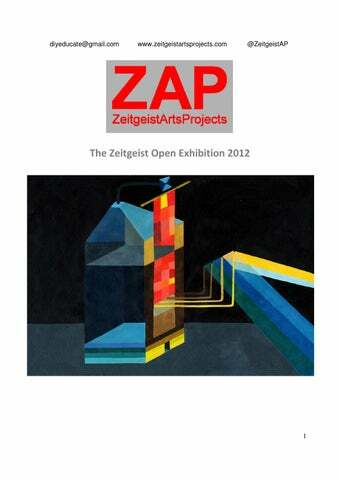 The Zeitgeist Open’s stated aim is ‘to create a really open Open, resulting in an exhibition that is about the artwork, and about intelligent artists making critical, educated and also instinctive decisions about the artwork.’ In developing The Zeitgeist Open, its founders Davis and Tilley say they have attempted to reevaluate the premise of the open submission experience in terms of how artists are treated, valued and supported before, during and after the event. Catalogue compiled by Rosalind Davis and Holly Simpson.